Featuring up to 20 different battling opponents, Battroborg mini cyborg robots are individually controlled by sophisticated motion sensors and come with a neat recharging section to plug in and re-charge your robot after a fierce battle. Featuring realistic sound effects, players can really believe they’re in the middle of a heavyweight boxing fight where the aim is to be the last robot standing! A ‘hit’ sensor is built into every Battroborg’s helmet, and an LED display on the robot backpack indicates how many lives are left. Distributed in the UK by Tomy, these battling robots feature a single motor that’s connected to a clever system of linkages that throws punches and moves the feet. Customisation is possible by placing images of yourself behind the helmet visors, as well as decorating the robots from the flags and stickers that are supplied with each one. Battroborg robots operate using a wireless 2.4HGz connection, with a ten minute play time from the re-chargeable batteries. Available in four stunning colours - Mars Red, Star White, Cosmic Black and Earth Blue – Battroborgs can be used on any flat surface or in the separately available Battroborg ring. Also available is the Hexaring which includes two robots. 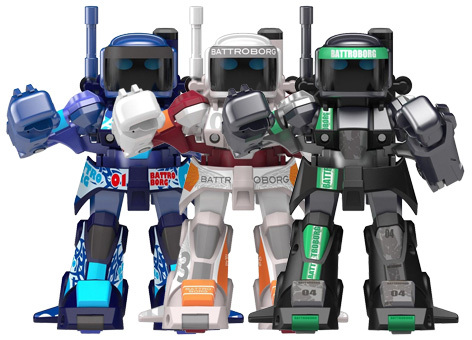 Please tell us what you think of the Battroborgs by Tomy.